Good afternoon! Today we will cook pancakes with milk. Traditional, classic pancakes. I will teach you how to make them look very thin and how to use ingridients in a right proportion. So that your dough has turned out to be delicious. See recipe below the video!. Take eggs. Eggs should have a room temperature.. Put eggs in the bowl, where they will be whipped. Whip eggs until thick foam. Like that..
Now we take salt. Salt - a little less than half a teaspoon..
That much. Don't be afraid to use salt for salt will activate suger and suger will activate salt.. Therefore, to make your pancakes testy, add a little less than half a teaspoon, for if you put less than that, the taste of suger will not be that swit.. So - do not be afraid of salt, Put a little less than a teaspoon. Now... suger. I love sweet pancakes, so. I put 1-2 tablespoons..
Now, let's mix it all. See that sugar has it's maximum dissolvement.. Here we have suger completely dissolved and everything looks like a thickish egg mass. Now we add flour and again we use the mixer. .. Mix the ingredients untill you have a smooth mass. At first, do not turn on the mixer. Operate only with your hands, and then - turn your mixer on. Now we take the milk. Very important: milk should have a room temperature. Never warm up, and never use it right from the refrigerator. otherwise you are sure to have lumps in your dough..
Well lumps are not a big deal, for they will dissolve on your frying pen anyway but to it is better to have a dougt without them. O.K. Now it's time to add some milk to to mix everything again..
See how many bubbles! The more, you, mix the more air bubbles you receive More bubbles - more good you have..
Now take the sunflower oil. I pour out a tablespoon of sunflower oil into the dough.. I mix it all in a good way- and our dough is ready. How to check if the dough is ready? Take a ladle: the dough should be leaky.. It is not as leaky as water but it is leaky! If your pancake dough is a little thick - it is not the end of the world. In that case your pancakes will be thicker too.. The real problem is when the dough is TOO leaky, for you will not be able to take pancakes from your frying pan. But if you follow my recipe your pancakes will turn out to be very good and rather thin.. So If you want thicker pancakes - add a little flour..
Now, set aside the dough for half an hour at least. Put it either in the refrigerator or on the kitchen table.. If your dough will stay during the night, it'll be even better - the pancakes will be even tastier. Some words about the pan. It should be a special pancake fryingpan. Any diameter: I have somewhere 8.6 inches. It should be heavy..
With a massive bottom in order not to burn them. So a massive bottom produces pancakes with a beautiful golden crust on the top..
Everything, of course, depends on the type of your cooker: gas or electric..
To make a story short: you should have a special frying pan for pancakes. It should be heavy with a massive bottom..
And now we take the sunflower oil. Before baking my first pancake I cover the bottom of the pan with some oil.. It will make the first pancake to be taken out of the pan easily. During the rest of the cooking process there will be no need to do it over and over again. But it is up to you. In case I bake a large number of pancakes, I grease the bottom with oil several times..
And now one more hint. Take a usual butter and melt it. In a microwave oven or in any other way..
After removing each pancake from the pan, lubricate it with butter..
Do it at once. Never wait!. In that case each pancake will be soaken with butter, never will be hard, and it will be incredibly delicious butter gives a very delicate flavor..
Now, let's make our pan hot and start the baking. Pour in the middle of the pan our dough and distribute it all over the frying pan.. Here's a pancake, we have received: it is ready, and it can be removed..
Greeze it with butter and distribute the butter all over the pancake. Do not spare the butter, the more butter - the tastier, softer and tender your pancake will be.. These are the pancakes we have. As the sun!. According to your taste you can add to the dough a little vanilla or vanilla sugar - It will add a smell of vanilla. 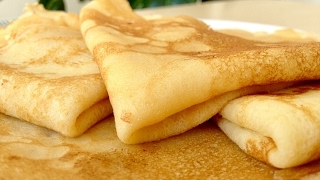 If someone wants to wrap pancakes stuffed with meat, then put a little less sugar, if curd - then - the sweeterr, the better. Pancakes are served in any way you fancy.. Even make pancake cakes. Bon Appetit! I think you'll like, it is a very delicious recipe, and most importantly - you will get thin pancakes. The amount of pancakes I in my hands comes out the amount of ingredients in the list given above. I think that your family, will love it. Thank you for being with me today, Thank you for subscribing on my channel, like my video if you enjoyed it. Bye, bye!